Will Video Interviews of the Near Future Look Like This? Video interviewing has without a doubt revolutionized the interview process, but it does have one obvious drawback: according to a study from the Degroote School of Business, video interviews have a dampening effect on candidate personalities. As a result, video interviewees are rated as less attractive, less likable, and less competent than face-to-face interviewees. While HD technology and optimal on-screen personal presentation can start to address the dampening effect, video interviews are still a long, long way from the real thing: the face-to-face encounter. The good news is, there are some emerging technologies out there that can bring video interviews one, two, or perhaps several steps closer to the real thing. Of course, the optimal video interview would create a simulated all-sensory experience just like the real thing, much like the holodeck on Star Trek. We might not have holodecks yet, but we do have some intermediary technologies that may turn video interviewing into a more authentic, sensory, and even holographic experience. Way back in 2012, fans at the Coachella Valley Music and Arts Festival were presented with a holographic performing/moving image of the deceased rapper Tupac Shakur. There’s no question, then, that we have the technology to do some kind of crude holographic video interviewing, but it’s no doubt prohibitively expensive — or it was way back in 2012. In 2013, a research group from MIT started working on a technology that could bring true holographic technologies to the mass market. This means that holographic interviewing and rudimentary holodeck-style interview rooms may be on the horizon; they may even appear within our lifetimes. Ostendo, a startup based in California, plans to roll out a hologram projector chip for smartphones in 2016. The holograph projector is called a Quantum Photonic Imager (it really is the stuff of Star Trek), and in the company’s own words, it will produce crisp videos and 3D images for giant screens and smartphones without the need for 3D glasses. So, arguably, employers may be able to engage in some level of holographic video interviewing within the next 3 years. Mind-blowing stuff! This is not the only path that video interviewing could eventually go down. The startup Affectiva has designed emotion-recognition technology, which enables computers to recognize human emotions based on facial cues and physiological responses — something you don’t even get in face-to-face interactions. Affectiva plans to use this technology to develop and refine marketing message and advertisements. 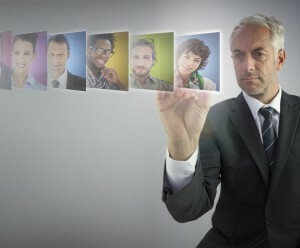 This technology could have an application in video interviewing: it would allow employers to monitor interviewers’ levels of excitement, anxiety, and stress, creating a more authentic candidate experience and compensating for the personality dampening effect of the video screen. For example, a candidate might not show any visible reaction to a question you pose, yet their heart rate and skin temperature might leap, indicating the question has triggered them. This would indeed be a massive shift for the video-interviewing experience, with lots of work to be done before it was culturally accepted, but it is no doubt a potential avenue for video interviewing to explore. Video interviewing is a powerful technology, but it is still in a very basic form, compared to the sensory-rich, holodeck-style interview experience that corporations may be able to engage in within the next 2-5 years – potentially sooner.